Hi, everyone! I'm Stephanie and I have a little style blog called Kitschy. 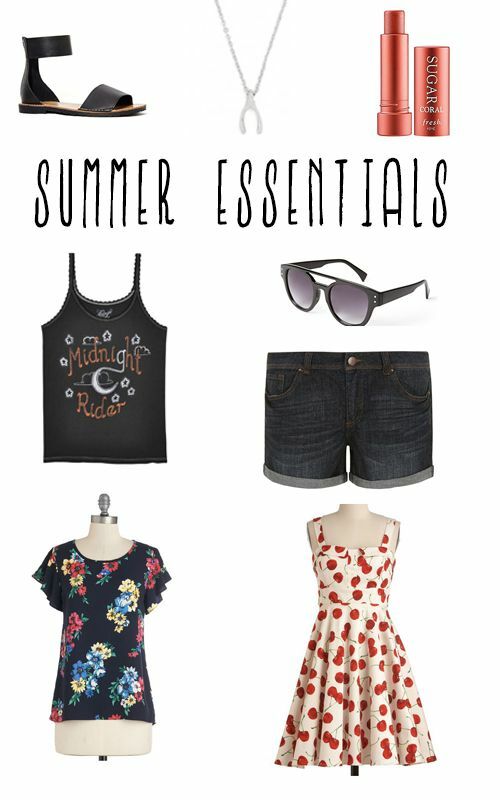 Summer is one of my favorite seasons, so what better than to have a round-up for some must haves? I aim to look for pieces that are great for mixing and matching, or stowing away in a weekender for an impromptu trip. 1. Nasty Gal Sandals, $48. Perfect for dresses or shorts. 2. Bauble Bar Wishbone Necklace, $28. A delicate pendant is always my favorite. 3. Sugar Lip Balm, $22.50. I love sheer tints -- one swipe is all you need for a glowy look. 4. Bonadrag top, $64. I renewed my love for graphic tees and this one is sassy enough for a outdoor festival but sweet enough for night time drinks with gal pals. 5. Forever 21 Sunnies, $5.80. Classic sunglasses go with a myriad of outfits. 6. Dorothy Perkins Cut Offs, $35. It ain't summer without shorts, am I right? 7. Modcloth Blouse, $29. I'm convinced that I can't go wrong with a pretty print, no matter the occasion. 8. Modcloth Dress, $64. My love for vintage flair knows no bounds -- get some rockabilly throwback with these cherries. Come stop by Kitschy sometime and say hi!